Start your holiday shopping or pick up something special for yourself from Kendra Scott. 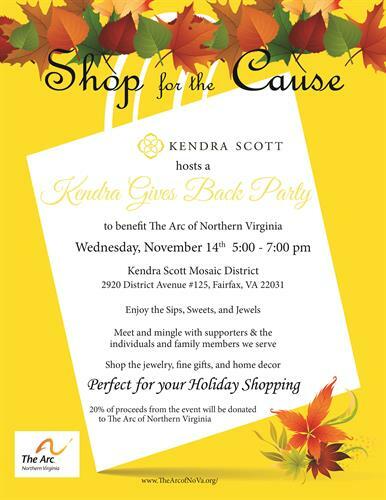 Join us on Wednesday, November 14th from 5-7 pm at the Kendra Scott store in The Mosaic District in Merrifield for a Kendra Gives Back Party benefiting The Arc of Northern Virginia. Kendra Scott will donate 20% of all purchases made during the party to The Arc, to support the programs and services provided to help individuals with intellectual and developmental disabilities – of all ages – and their families. Bring your friends along for a shopping event that gives back! To browse Kendra Scott ‘s jewelry collections prior to the party, visit www.KendraScott.com. For those that are unable to attend but would still like to show your support, phone orders will be accepted on the day of our event. Just call Kendra Scott – Mosaic District at (571) 253-7355, and be sure to mention The Arc of Northern Virginia when placing your order! Phone orders to the store on the day of the event will qualify for the 20% donation – AND SHIPPING IS FREE!